R and I don’t usually don’t have time to really cook dinner on weeknights b/c we get home so late, so on nights like tonight, we rely on heating up leftovers. I had gotten a little tired of the rice and aloo combo, so I decided to turn my leftover aloo gobi sabji into a sandwich. The equivalent of a veggie “burger” in India is a vegetable patty made of mostly just vegetables with potatoes (aloo) binding the ingredients together. Veggie patties are an easy way to use leftover sabji (i.e. dry vegetable dishes). 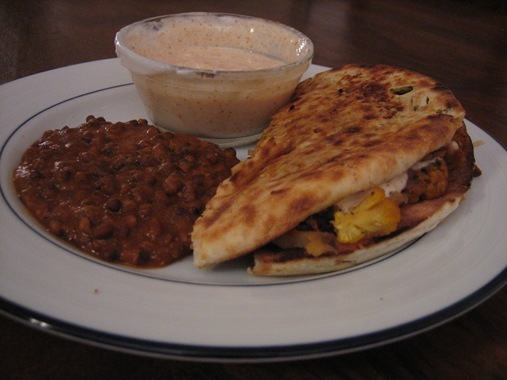 I folded my aloo gobi patty between an onion kulcha, covered with a smear of lemon pickle and raita and accompanied by a side of Trader Joe’s dhal makhani. For those of you that haven’t had kulcha before, it’s like a stuffed naan. Yum. Raita: There are a lot of different varieties of raita, and that is usually R’s area of expertise. I went for basic raita – take about a cup of yogurt and whisk it with a fork. Add salt, about 1/4 tspn. chaat masala (or to taste) and a sprinkle of salt and lal mirch. Mix well. Add the leftover sabji to an oiled, heated pan and use a flat, wooden spoon to break up and mash the sabji together. After its well heated, remove from the pan. Take the onion kulcha out of the freezer (I used onion kulcha this time but garlic naan is delicious as well) and heat it in the pan, flipping it when it browns on one side. Cut it down the center. If you use garlic naan, put the side with the garlic facing down so the garlic doesn’t fall off. Spread a layer of lemon pickle on one side of the kulcha using just the relish part – not the actual pickles. Pile the sabji onto one side kind of trying to press it into place, drizzle raita over the top and cap it off with the other half of the kulcha. Put it back in the pan to reheat. As an aside, the Trader Joe’s dhal makhani is delicious and passess R’s healthy test (I don’t really know how to read nutrition labels but I’m trusting him on this one). It comes in a silver pouch which you’re supposed to boil in water – we always just pour the contents of the pouch into a bowl and microwave it. We’ve tried some of their other Indian packaged food, and it hasn’t been great (the eggplant was downright bad) but we try to always keep a few packs of the dhal on hand. Their naan and masala burgers are really good too.